One indelible day--January 22, 1973: Abortion, LBJ death, Kissinger in Paris to initial Peace Accords on Vietnam. American politics would change forever. Later that same day, Lyndon Johnson would die of a heart attack in Texas. 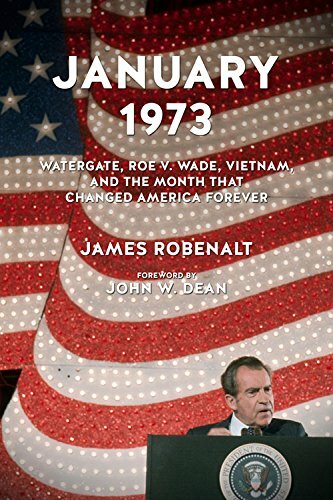 Richard Nixon's counterrevolution was at its high watermark in January 1973. Ronald Reagan would pick up what Nixon started and call it the "Reagan Revolution," but in fact history will more accurately record it as the "Nixon Counterrevolution." With the deaths of Harry Truman and Lyndon Johnson and the end of the Vietnam War for the United States, a new era dawned. This month marked figurative and literal endpoints for the New Deal and the experiment called the Great Society. Nixon preached a message of self-reliance in his second inaugural, purposely twisting JFK's famous "ask not" line from his inaugural: "Let each of us ask--," Nixon declared on January 20, 1973, "not just what the government can do for me, but what I can do for myself." It was the start of the "me generation." Idealism, under its own heavy weight, gave way to cynicism and self-interest in government. Two days after the Nixon's second inaugural, the United States Supreme Court decided Roe v. Wade, and the politics of "no compromise" found its way into our national political bloodstream. What Nixon started--culture wars and divisiveness in government--Roe supercharged. We live today in the shadow of the Nixon Counterrevolution and Roe. Much can be explained about our current government of deadlock from the great events of this month. January 1973 heralded immense change. Read about some of the stories in this website and scroll through the photo gallery.